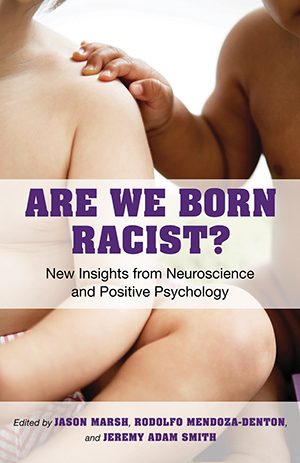 Beacon Press: Are We Born Racist? Where do our prejudices come from? Why are some people more biased than others? Is it possible for individuals, and society as a whole, to truly defeat prejudice? In these pages, leading scientists, psychologists, educators, activists, and many others offer answers, drawing from new scientific discoveries that shed light on why and how our brains form prejudices, how racism hurts our health, steps we can take to mitigate prejudiced instincts, and what a post-prejudice society might actually look like. How prejudiced are you? Most people think they’re less biased than average. But just as we can’t all be better than average, we can’t all be less prejudiced than average. Although the success of Barack Obama’s presidential campaign suggests an America that is moving past traditional racial divisions and prejudices, it’s probably safe to assume that all of us harbor more biases than we think. Science suggests that most of us don’t even know the half of it. A twenty-year eruption of research from the field of social neuroscience reveals exactly how automatically and unconsciously prejudice operates. As members of a society with egalitarian ideals, most Americans have good intentions. But new research suggests our brains and our impulses all too often betray us. That’s the bad news. But here’s the good news: more recent research shows that our prejudices are not inevitable; they are actually quite malleable, shaped by an ever-changing mix of cultural beliefs and social circumstances. While we may be hardwired to harbor prejudices against those who seem different or unfamiliar to us, it’s possible to override our worst impulses and reduce these prejudices. Doing so requires more than just individual good intentions; it requires broad social efforts to challenge stereotypes and get people to work together across group lines. But a vital first step is learning about the biological and psychological roots of prejudice. Old-fashioned prejudices were known quantities because people would mostly say what they thought. Blacks were lazy; Jews were sly; women were either dumb or bitchy. Modern equivalents continue, of course--look at current portrayals of Mexican immigrants as criminals (when, in fact, crime rates in Latino neighborhoods are lower than those of other ethnic groups at comparable socioeconomic levels). Most estimates suggest such blatant and wrongheaded bigotry persists among only 10 percent of citizens in modern democracies. Blatant bias does spawn hate crimes, but these are fortunately rare (though not rare enough). At the very least, we can identify the barefaced bigots. Our own prejudice--and our children’s and grandchildren’s prejudice, if we don’t address it--often takes a subtler, unexamined form. Neuroscience has shown that people can identify another person’s apparent race, gender, and age in a matter of milliseconds. In this blink of an eye, a complex network of stereotypes, emotional prejudices, and behavioral impulses activates. These knee-jerk reactions do not require conscious bigotry, though they are worsened by it. We then slid other participants into a functional magnetic resonance imaging (fMRI) scanner to observe their brain activity as they looked at these evocative photos. Within a moment of seeing the photograph of an apparently homeless man, for instance, people’s brains set off a sequence of reactions characteristic of disgust and avoidance. The activated areas included the insula, which is reliably associated with feelings of disgust toward objects such as garbage and human waste. Notably, the homeless people’s photographs failed to stimulate areas of the brain that usually activate whenever people think about other people, or themselves. Toward the homeless (and drug addicts), these areas simply failed to light up, as if people had stumbled on a pile of trash. We were surprised--not by the clear sign of disgust, but by how easy it was to achieve. These were photographs, after all, not smelly, noisy, intrusive people. Yet we saw how readily physical characteristics could evoke strong, immediate, and deep-seated emotional reactions. Results like these have obvious implications for racial prejudice, which is often elicited by similarly superficial characteristics. Indeed, a great deal of recent research has shown how our knee-jerk biases are directed toward members of other races. Research by New York University psychologist Elizabeth Phelps and her colleagues has found that even dull yearbook photographs can trigger a strong neural response. When white men in their study briefly saw pictures of unfamiliar black male faces, their brain activity spiked in a region known as the amygdala, which is involved in feelings of vigilance generally, and in the fear response specifically; the amygdala lights up when we encounter people or events we judge threatening. Several other labs, including my own, have uncovered a similar link between amygdala activity and white people’s perceptions of black faces. Other research has uncovered more subtle forms of racial bias. In one study neurosurgeon Alexandra Golby and her colleagues showed participants images of white and black faces. When white participants saw white faces, their brains showed more activity in a region that specializes in facial recognition than when they saw black faces; the same went for black participants when they saw black faces. For some reason, those other-race faces didn’t register as human faces in the same way that same-race faces did. Later, all participants saw a series of white and black faces, some of which were new faces and some of which were faces they’d already seen during the brain scans. Sure enough, both white and black participants proved better able to remember people of their own race. Work by Stanford psychologist Jennifer Eberhardt and her colleagues suggests that these rapid, unconscious facial perceptions can have deadly consequences. The researchers had participants analyze photos of African American men convicted of murder, rating how “stereotypically black” the men’s facial features appeared. Some of the men had been sentenced to the death penalty; some had been given less-severe sentences, though the participants didn’t know which men were which. Even after controlling for relevant variables such as the severity of the murder and the defendant’s facial attractiveness, socioeconomic status, and prior convictions, it turned out that black men were more than twice as likely to be carrying a death sentence if they had facial features that were judged by study participants as more “stereotypically black.” (However, this discrepancy only existed if the murder victim was white. The defendants were no more likely to get the death penalty if their victim was also black.) Meanwhile, in studies mimicking how the police deal with criminal suspects, University of Chicago psychologist Joshua Correll and colleagues have shown that police officers, community members, and students playing a video game are faster to “shoot” an armed black man than an armed white man, and they’re faster to avoid shooting an unarmed white man than an unarmed black man. (For more on this line of research, see Alex Dixon’s “Policing Bias” later in this anthology.) Cultural stereotypes and emotional prejudices register on the brain as quickly as a fifth of a second--enough time to determine whether a suspect lives or dies. Similar studies have shown that people demonstrate strong preferences toward those wearing the soccer jersey of a team they like, people who share their birthday, and people who subtly resemble themselves, not to mention those of their own race or ethnicity. Conditioned by millennia of tribal warfare and fierce competition for limited resources, we are always looking for cues to help us make snap judgments about others. Unfortunately, as we gravitate toward the familiar and the similar, all too often we rely on physical characteristics to determine whether someone is in our in-group or out-group. In that light it’s not hard to understand why so much prejudice is directed at people based on their race. What’s more, we all have to contend with our culture’s influential role in shaping prejudice. Years, even generations, of explicit and implicit cultural messages--gleaned from parents, the media, firsthand experiences, and countless other sources--link particular physical appearances with a host of traits, positive or negative. The roots of these messages can stretch back centuries, as is the case with racism toward people of African descent in the United States and its origins in the age of slavery. Such messages are absorbed, accepted, and perpetuated, often unconsciously, by our culture’s members and institutions. That’s how prejudices become so widespread and automatic.